Pineapple Sage, A Late Season Bloomer That’s Worth The Wait! Late season color isn’t limited to asters and mums. Another that takes center stage this time of the year, and that makes us wait all summer, is the pineapple sage, Salvia elegans. And elegant it is, with beautiful red blooms that begin in October and continue through the month. I’m sure their scarlet red blooms, signaling nectar, are a happy sight for migrating hummingbirds too. The one pictured here is just beginning to bloom in my garden. Introduced into horticulture around 1870, pineapple sage has been around awhile, and new cultivars include a yellow-green leaf version. I prefer the old standby with medium green leaves that grows about 4 1/2 tall and makes a wide clump with age. Give it room! Put it in a sunny spot, keep it watered, and be prepared to wait for buds that begin to form in late September…about when another beautiful salvia, Mexican Sage, Salvia leucantha, also begins to show color. 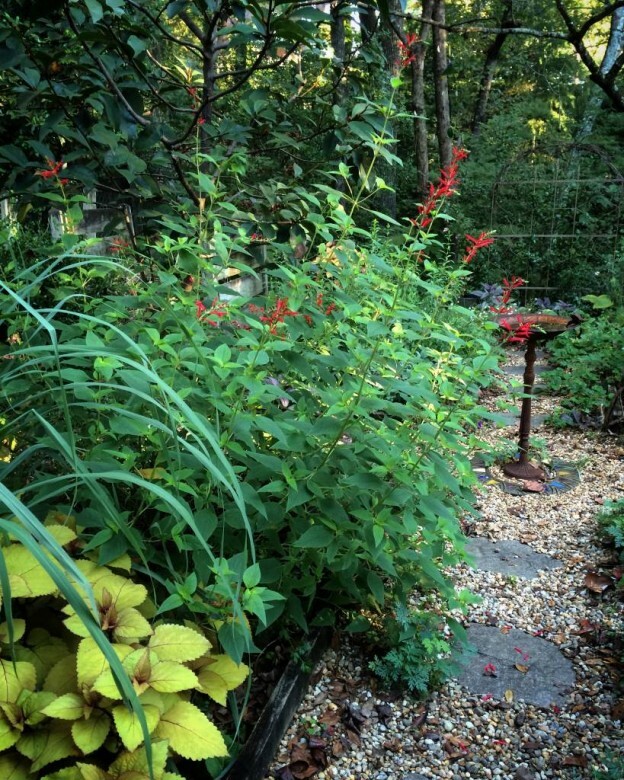 In Birmingham pineapple sage is a tender perennial and will die to the ground with a killing frost. Knowledge is power. Knowing it is tender, be certain to mulch it well with shredded pine bark or pinestraw. Brushing against the leaves of pineapple sage is an olfactory pleasure, as it really does smell exactly like pineapple. They’re edible and can be made into a tea or chopped into salads. The brilliant red blooms can be eaten too, but I prefer them as a striking garnish on a plate and would rather look at them than eat them I think! If you’d like to try this beautiful salvia in your garden, stop in. There are some available now. 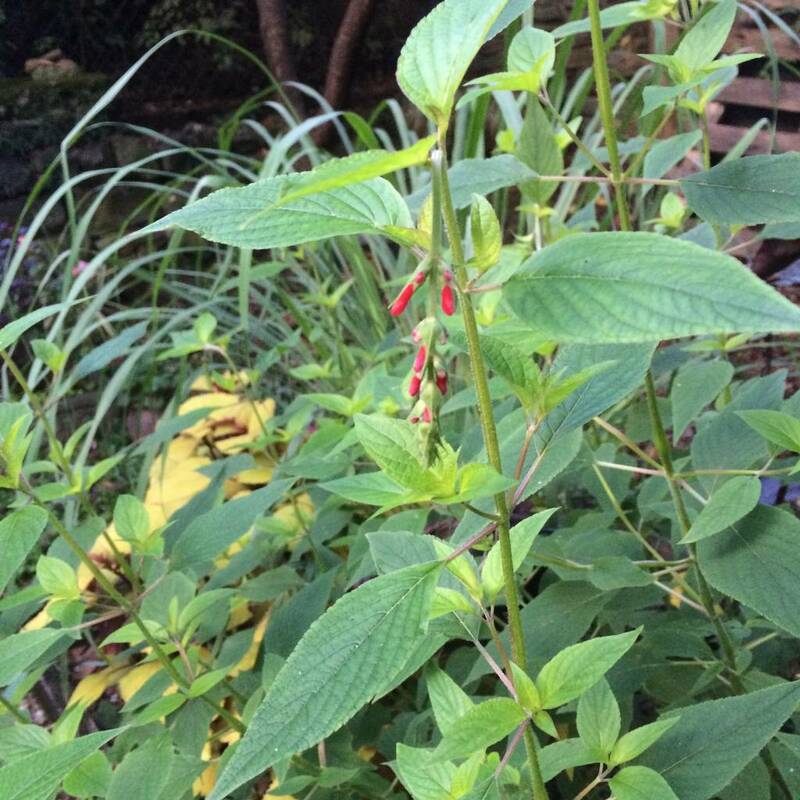 This entry was posted in Fall, Flowers, Herbs, Perennials, Planting Tips and tagged hummingbird flowers, mexican sage, pineapple sage, salvia elegans, salvia leucantha on October 13, 2015 by Kris Blevons.